Joseph Smith’s official, canonical account of Moroni’s first visitation to him includes specific details that pose some interesting and challenging difficulties for the veracity of the account. According to the account (written in 1838), Joseph was praying at night on September 21, 1823, when a light appeared in his bedroom and “continued to increase until the room was lighter than at noonday” (Joseph Smith—History 1:30). The angel then spoke to Joseph at length, reappearing two more times in the same manner, keeping Joseph awake most of the night (1:30-31). What this account neglects to mention is that Joseph shared his bedroom, and even his bed, with some of his brothers. None of the adult children of Joseph Sr. and Lucy Smith had yet been married and all nine of them still lived with their parents. In September 1823 the Smith children and their ages were Alvin, 25; Hyrum, 23; Sophronia, 20; Joseph Jr., 17; Samuel, 15; William, 12; Katherine, 10; Don Carlos, 7; Lucy, 2. In an article in the LDS magazine Ensign, Donald Enders described the Smith log cabin as “a one and one-half story structure with two rooms on the ground level and ‘a garret above divided into two apartments.’” Enders noted that “the chamber above the two rooms probably served as sleeping quarters for most of the Smith children.” A bedroom was added in July 1821 as the children became older, but even so, at the time of Moroni’s first visitation the log house was “home to parents and nine children,” with room for at most three beds to accommodate the seven boys.1 Thus, Joseph shared one small bedroom with at least four and probably five of his six brothers, and in fact must have shared a bed with one or two of them. Joseph’s Brothers: Like Paul’s Companions? Mark Ashurst-McGee’s response to the problem of Joseph’s brothers in the room during Moroni’s visitations is a good example of an ad hoc claim: “For those who do believe in Joseph’s visions, the argument sounds theologically naive. Could not Moroni manifest himself to Joseph only? None of Paul’s companions on the road to Damascus saw the resurrected Christ. A vision needs only to hold the attention of the visionary. Joseph’s brothers can sleep in peace.”5 The differences in the two cases, however, accentuate the problem with Joseph’s account. 2. When he appeared to Paul, Jesus was a resurrected and glorified man (Luke 24:36-43); however, he had ascended to heaven (Acts 1:9-11) prior to his appearing to Paul. Paul’s later reference to his experience as a “heavenly vision” (Acts 26:19) suggests that Paul saw the risen Christ in heaven and that Christ was not physically present on the Damascus road. On the other hand, Christ’s appearance to Paul was manifested in a bright light and the sound of a voice that Paul’s companions witnessed even though they did not see Jesus and did not hear what Jesus said to Paul (Acts 9:7; 22:9).7 By contrast, Joseph’s description of his experience of seeing Moroni was supposedly not just a vision but a visitation; i.e., Moroni was supposedly literally, physically in the room. Here it is worth noting that Ashurst-McGee himself recognizes the significance of this distinction.8 A vision would be an event typically seen only by the visionary, though others who were physically present might experience some effects of the vision, as did Paul’s companions. A visitation would be an event typically experienced by anyone physically present and in eyeshot or earshot of the visitor. Joseph was very explicit and graphic in describing Moroni as a very physical, human individual who was literally in his bedroom (see JS-H 1:30-32),9 and this literal, bodily presence in his room is clearly distinguished from a “vision” that he had in which while still in his room he could see in his “mind” the specific outdoor location where the gold plates were buried (1:42). Likewise the “light” that he saw around the angel was specifically and repeatedly said to have been in the room (1:30, 32, 43, 44). 3. In LDS theology, angels that appear to people are generally not regarded as incorporeal beings that have taken on temporary visible manifestations. Such angelic appearances are generally understood to be visitations by resurrected human beings possessing immortal, glorified physical bodies. This belief in physical angels implies that the reason we normally don't see these angels is that they are not here; they are physically present with God in heaven, not walking around on earth where everyone can see them (as one caustic Mormon critic erroneously inferred I was implying). LDS doctrine does acknowledge the existence of angels that are spirits lacking bodies of flesh and bone, but even such spirits are viewed in Mormonism as corporeal or embodied beings. In any case, Moroni, specifically, is said to have been a resurrected Nephite prophet and the son of the Nephite prophet Mormon; Moroni is identified as the man who finished his father’s book and eventually deposited the gold plates in the hill near Joseph Smith’s home. Thus, a visitation by such a physical being (as distinguished from a vision of such a being) would be presumed to be visible and audible to anyone in a physical location to see and hear unless the account stated otherwise. This point is not negated by the observation that Moroni is described as "standing in the air" above the floor (JS-H 1:30). That description is consistent with Joseph's claim that Moroni was a physical being that had been glorified and thus imbued with supernatural powers. Again, there is nothing in the text that would indicate that Moroni, though a physical being of flesh and bone, was miraculously made visible to Joseph but undetectable to his brothers. 4. Paul’s companions did not see Christ, but they saw the light, saw Paul fall to the ground, and afterwards helped him to get to Damascus because they knew he had been struck blind (Acts 9:4-8). Thus, the companions had visual and auditory experiences during Paul’s vision, and of course they saw and heard what Paul did. By contrast, Joseph’s brothers and other family members apparently saw and heard nothing, despite the brilliant light, the physical presence of the angel in the room, and the long conversations that took up most or all of the night (JS-H 1:47). They did not even see or hear Joseph do or say anything during the night. According to the account, Joseph was initially afraid (1:32), and presumably that reaction of fear would have caused him to react in a startled manner that might well have awakened one or more of his brothers. Joseph also said that during the encounter he and Moroni were “conversing” (1:42), meaning that Joseph himself spoke during the encounter. Yet we know that Joseph’s brothers did not see or hear anything unusual that night because the next day Joseph’s father knew nothing about what had happened until after Moroni appeared to Joseph a fourth time and instructed him to tell his father (1:49-50). Joseph’s Brothers: Like Elisha’s Servant? Well, if Joseph Smith’s narrative is false due to this miraculous event (is Bowman really implying God cannot shields others in a room from a conversation between Joseph and an angel as well as the glory emanating from the latter? ), then the Old Testament fails, too. However, I certainly do not fault Joseph’s account for including a “miraculous event.” Joseph claimed that an angel appeared to him; I am not arguing that the account is false because it makes that miraculous claim. If Joseph had written that his brothers were supernaturally kept from waking up while the angel flooded the room with light and talked to Joseph all night, such a statement would be a miraculous claim and we would need to consider it. As it stands, though, Joseph’s account makes no such claim. Rather, this claim is being made by Mormon apologists after the fact, ad hoc, to account for the apparent difficulty. I certainly do not deny that God could prevent others in a room from being aware of a conversation taking place there or of the presence of an angel in the room. The question is whether this explanation, which arises not from Joseph’s account but from the need to square his account with external information that he omitted, is more than just ad hoc. Let’s give close attention to the text and notice what it says. Elisha’s servant is explicitly mentioned. The narrative makes it quite clear why he did not at first see the supernatural forces: they were not naturally visible beings. Elisha had already seen his predecessor Elijah taken up into heaven by “a chariot of fire and horses of fire” in a whirlwind (2 Kings 2:11), and now Elisha prays for God to reveal to his servant the presence of an army of “horses and chariots of fire” (2 Kings 6:17; cf. Ps. 68:17; Isa. 66:15; Jer. 4:13). Elijah’s servant had to be granted the ability to see those supernatural beings. Notice that the servant is not rebuked for lack of faith or anything along those lines; his not seeing the supernatural beings was not his fault, because they were not natural entities that would be normally visible to human eyes. God had to “open his eyes” to see them. The fact that the account reports that the servant at first did not see the supernatural army and then did see it is explained in the account itself as involving the miraculous. The reader is not forced to this explanation ad hoc to resolve some external difficulty; it is what the text actually says. Notice a key difference between the account of Elisha's servant seeing the supernatural army in 2 Kings and Joseph Smith's account of seeing Moroni: In 2 Kings, the supernatural forces were by nature incorporeal and by default invisible to mortals unless they were given special ability to see them. In Joseph Smith's account of seeing Moroni, the angel was a corporeal, physical being who was by default visible to mortals if he was in their immediate presence, forcing Mormons after the fact to conclude that Joseph's brothers must have been supernaturally prevented from waking up or from seeing or hearing the angel or the bright light he was emanating. Boylan is simply mistaken, then, when he claims that I am “guilty of a double standard” in accepting the story of the angelic army (who was seen by Elisha but not by his servant until God permitted him to see it) but not accepting the story of Moroni (who was seen by Joseph but not by his brothers). 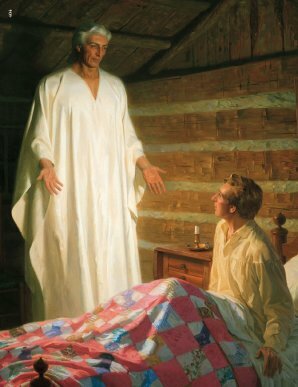 The account of Moroni’s visit in Joseph Smith’s bedroom says nothing about Joseph’s brothers, let alone asserts that they were miraculously prevented from seeing or hearing Moroni, or becoming aware of Joseph being awake and talking with someone all night. So this is not a matter of accepting something in the Bible but not accepting something similar in the Mormon scriptures. Joseph Smith—History doesn’t even make the claim that Moroni’s presence was known to Joseph but not to his brothers. That claim is to be rejected not because it is miraculous and not in the Bible, but because it is ad hoc. The problem of how Joseph’s family could have been unaware of Joseph staying up all night talking to a brilliantly shining angel could be solved by taking the position that the experience was originally understood as a dream vision rather than a visitation. Such an explanation would merely defend one element of the canonical account (the nocturnal experience in Joseph’s bedroom) by rejecting another element of the same account (the literal appearance of a resurrected man in the room). It therefore fails to make the account any more plausible. 1. Donald L. Enders, “The Joseph Smith, Sr., Family: Farmers of the Genesee,” in Joseph Smith: The Prophet, the Man, ed. Susan Black Eastman and Charles D. Tate Jr., Religious Studies Center Monograph Series 17 (Provo, UT: Religious Studies Center, BYU, 1993), 213-25. 2. Cf. Clay L. Chandler, “Scrying for the Lord: Magic, Mysticism, and the Origins of the Book of Mormon,” Dialogue 36/4 (2003): 54 (43-78). 3. Richard Lyman Bushman, Joseph Smith: Rough Stone Rolling, with the assistance of Jed Woodworth (New York: Knopf, 2005), 39. 4. Paul Horwich, Probability and Evidence, Cambridge Philosophy Classics (Cambridge: Cambridge University Press, 1982, 2016), 101. 5. Mark Ashurst-McGee, “A Pathway to Prophethood: Joseph Smith Junior as Rodsman, Village Seer, and Judeo-Christian Prophet,” M.A. thesis (Utah State University, 2000), 293. 6. See “Moroni’s Visitation,” MormonThink, last updated apparently March 2014; accessed Sept. 6, 2017. 7. See Robert M. Bowman Jr., “Did They Hear What Paul Heard? Acts 9:7 and 22:9 Revisited” (Academia.edu, 2015). 8. Ashurst-McGee, “Pathway to Prophethood,” 10. 9. Joseph’s comment that Moroni was “standing in the air, for his feet did not touch the floor” (JS-H 1:30) does not negate this point at all. The description pictures Moroni physically present in the room and “standing in the air,” a feat implicitly explained by his having a glorified body with supernatural powers. 10. Robert Boylan, “Moroni Appearing in Joseph Smith’s Room and Elisha’s Angelic Army: Another Evangelical Double-Standard,” Scriptural Mormonism (blog), 30 Oct. 2016. Boylan includes an “Update” dated June 2017 impugning my “intellectual credibility” because this article had not as of that date been revised. Boylan’s blog post, however, was responding not to the earlier version of this article, but to a two-sentence paragraph summarizing the issue in a list of questions about the Book of Mormon in my article “A Biblical Scholar Looks at the Book of Mormon” (Cedar Springs, MI: Institute for Religious Research, 2016). See Boylan’s earlier criticism of that list of questions, “Answering Questions about the Book of Mormon posed by an Evangelical Apologist,” 27 Oct. 2016. 11. See our articles on Joseph Smith’s visions, prophecies, polygamy, and other issues, all of which can be accessed from our page on Joseph Smith, as well as our articles on the modern origins of the Book of Mormon.